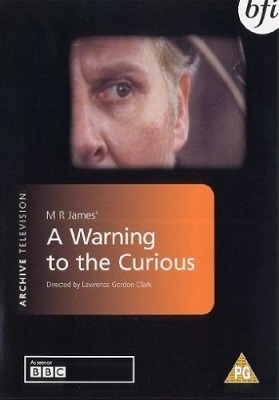 A Warning to the Curious is based on a story written by M R James and, like The Signalman, it was first screened as part of the BBC’s popular Ghost Story for Christmas series. The story is set on the Norfolk coast, where there is a legend about the three golden crowns of Anglia, which were hidden in the ground during the dark ages to keep them safe from marauding Vikings. The crowns were believed to have strange powers and as long as at least one of them remained undisturbed no foreign army would be able to invade the kingdom of Anglia. Since that time one of the crowns has been plundered and melted down and another has been covered by the encroaching sea. Only one remains. This story is about the people who come looking for the crown and, more accurately, what happens to them when they do. In the opening sequence, a man is shown digging in the woods. As he digs the wind begins to get up and starts blowing through the ferns. The man turns around and sees a fearsome-looking individual dressed in black is watching him. “No digging ‘ere,” the stranger says. “What do you mean no digging here?” the other replies. “I have permission. from the landlord.” This statement does little to pacify the man in black, who takes matters into his own hands. Twelve years later another man arrives by train, bringing a shovel with him and not giving the impression of someone who intends to build a few sand castles. The man, Mr Paxton, is played by Peter Vaughan who some viewers might remember for his portrayal of Grouty in the TV series Porridge. Paxton books into the local inn, borrows a bicycle, and then rides off in search of the crown. Paxton remains very focused on his ambition to find the crown and in the end, he learns where he needs to dig, only to discover that the crown is not as without protection as he had thought. A Warning to the Curious might be a little slow moving for some viewers’ tastes, but I enjoyed it immensely. There is some nice scenery and I liked the little inn that Paxton stayed in. It looked very peaceful. The story has some genuinely scary moments too, as you would expect from something unleashed from the pen of M. R. James. Even a truly brilliant story can be spoilt by a poor cast though. Fortunately, that has not happened in this case and A Warning to the Curious is just a spooky on-screen as it is on the written page.